2019 Wildcat Masters Invitational: Two Dates! Feb 24 and March 3! It is now 12:46 PM ET Time on Wednesday, April 24, 2019. 25 yards by 176 foot indoor pool; competition will be held in one 25-yard competition course (eight lanes each); water depth, 6 to 15 feet in competition lanes; nonturbulent lane dividers; separate warm-down area, four lanes. The priimary timing system will be automatic timing (Colorado Timing System with scoreboard). The official times from this meet may be submitted for USMS records and USMS Top 10 consideration. Balcony seating for 500. Telephone (859) 257-SWIM, ext. 1. The length of the competition course without a bulkhead is in compliance and on file with USMS in accordance with articles 105.1.7 and 107.2.1. Sunday, March 3, 2019: warm-ups at 8:30 a.m.; meet starts at 9:00 a.m. (ET) with event 2; event 3 will start no earlier than 10:30 a.m. Entry fee depends on whether entry is online, on paper, or a deck entry and whether the entry is for session 1 on February 24 (The Maehr Mile) only, for session 2 on March 3 (remaining events) only, or for both sessions. Session 1 only: $10 (online), $12 (paper), or $15 (deck entry). Session 2 only: $40 (online), $45 (paper), or $50 (deck entry). Both sessions: $45 (online), $50 (paper), or $55 (deck entry). Deck entries will be accepted for both sessions and all events. You may enter the meet online, and charge your entry fee to a credit card (Visa or MasterCard only). Please note: Your credit card will be charged by “Club Assistant Event Billing.” Online entry fees are nonrefundable. Each pre-entered swimmer will receive a commemorative meet T-shirt. Extra T-shirts may be available for sale toward the end of the meet, subject to availability. Event 1 (session 1), The Maehr Mile, is in memory of our teammate, Dave Maehr, who loved to swim the mile. All swimmers must be USMS-registered before warm-up starts on Sunday, February 24, 2019, at 8:30 a.m. for session 1, or Sunday, March 3, 2019, at 8:30 a.m. for session 2. All swimmers are responsible for their USMS cards and may be required to show them upon request by officials in order to compete in the meet. All paper meet entry forms must be accompanied by a copy of the swimmer’s current USMS registration card. Each swimmer is eligible to swim a maximum of seven individual events for the meet (one event on February 24 plus six events on March 3), plus relays. The age reported on your entry form must reflect your actual age as registered with USMS. Deck entries will be accepted until 8:45 a.m. for session 1, event 1 (The Maehr Mile) and session 2, event 2 (the 500 free), and until 10:00 a.m. for all remaining individual events. Each event will be seeded by the pre-entered seed time of each swimmer, with the slowest heats first. No time (NT) will be seeded in the slower heats. Swimmers will be seeded according to time, regardless of age or gender. Men and women will be seeded separately, except for The Maehr Mile and the 500 yard freestyle. All USMS-registered clubs and SKY workout groups should inform the meet director of one official team representative before the start of events 1 or 2 or upon the team’s arrival. All relays will be deck-entered. Team representatives or coaches will be responsible for all relay entries and picking up the official relay entry form and be responsible for printing legibly all information asked for, and each swimmer’s name as registered with USMS, age, and gender on the form. Awards will be given to the top scoring visiting team in small, medium, and large divisions. Divisions will be determined after close of entries. Individual awards will be given for first through eighth place by age groups and gender from 18-24 through 100+, and relays for first through eighth place by age groups 19+, 25+, 35+, 45+, 55+, 65+, 75+, 85+, and 95+. Points will be awarded by age group, men and women being scored separately. Individual: First through eighth, 9-7-6-5-4-3-2-1. Relays: First through eighth, 18-14-12-10-8-6-4-2. Any protest concerning seedings, awards, final results, eligibility, scoring, or entries must be addressed to the meet director or referee (USMS rule 102.16). The protest can be made by the team representative only. Swimmers on USMS-registered clubs, note the name of your club on your entry form and relay cards. Swim Kentucky Masters swimmers, note the name of your club and workout group on your entry form and relay forms. No fax entries accepted! No smoking in the building. No alcoholic beverages in the building. Children must be supervised at all times. No glass bottles on deck. The Lancaster Aquatic Center is located off of University and Complex Drives. From U.S. 60 (Versailles Rd. ), turn right on Mason-Headley Rd., which becomes Waller Ave. at Harrodsburg Rd. Keep going straight. Waller becomes Cooper Dr. at Nicholasville Rd. Keep going straight. Turn left at University Drive. The aquatic center is in the Seaton Building on the right. From I-64 and I-75, take U.S. 68 (Paris Pike-Broadway) all the way through town to West Maxwell St. and turn left. Take Maxwell St. to Rose St., and turn right. Take Rose St. to Columbia Avenue, and turn left. Take Columbia to Woodland Avenue, and turn right. Take Woodland Avenue to Hilltop Avenue and turn right. Take Hilltop to University Drive and turn left. Go straight at the stop sign at Huguelet Drive. The aquatic center is in the Seaton Building on the left, just past Complex Drive. E lots (unless noted on sign) and Parking Structure #1 at University and Cooper Drive; entrance is located off Hospital Drive. Commonwealth Stadium parking lots including C6 and K lots and the KET lot located across Alumni Drive and Stadium. Parking Structure #2 (three-story garage at the W.T. Young Library). E lot only off Columbia Avenue, behind front entrance to W.T. Young Library. Turn left as you enter. Park in E lot only. No R lot, as 24-hour towing is in effect. 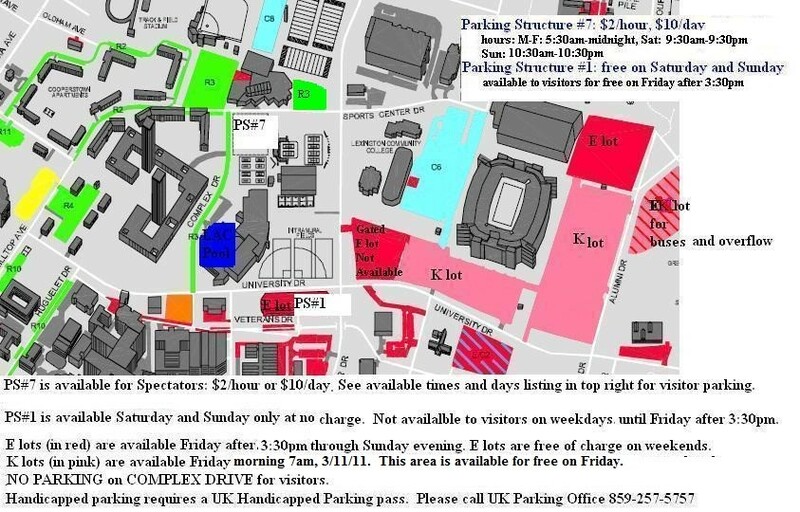 University Drive, must have any valid UK parking pass on Saturday and Sunday. Complex Drive and Sports Center Drive for R-3 spaces and other R-3 lots. These spaces are controlled 24 hours, seven days a week for R3 permits. Online Registration closed on 3/1/2019.